Back in June of 2011, my friend Erika and I went in together on a four seasons farm share ( CSA – Community – Supported Agriculture) with Native Offerings Farm. It was one adventure after another. Nothing of the rabbit hole variety, just subtle little discoveries and observations that can make an averaged day stand out as a little sweeter. After joining the CSA, I started a blog about it called My CSA Adventure. Before long, I found that the foodie in me started to come alive. So even though most of the posts were directly related to preparing my half of the farm share each week, some of it, including the stuff of daily life, was merely inspired by it’s goodness. Our membership ended in April of 2012, and our last share came overflowing with arugula, potatoes, roots and 2 jars (one for each of us) of kimchi. I added mine to my treasured stockpile of delicious and healthy fermented foods. All this goodness on the occasion marking the end of the blog, My CSA Adventure was a worthy tribute. It was a fun project and it started off with all the best intentions. But the business of life, a new job, and numerous arts deadlines prevented me from continuing with it. I moved all the posts over to Tender Ardour. You can check them out by clicking here or by clicking My CSA Adventure under categories on the right of the page. – Kimchi (or kimchee) is packed full of vitamins A, B, and C, but its biggest benefit is in its “healthy bacteria” called lactobacilli, which is found in fermented foods like kimchi and yogurt. This good bacteria helps with digestion, plus it seems to help stop and even prevent yeast infections, according to a recent study. 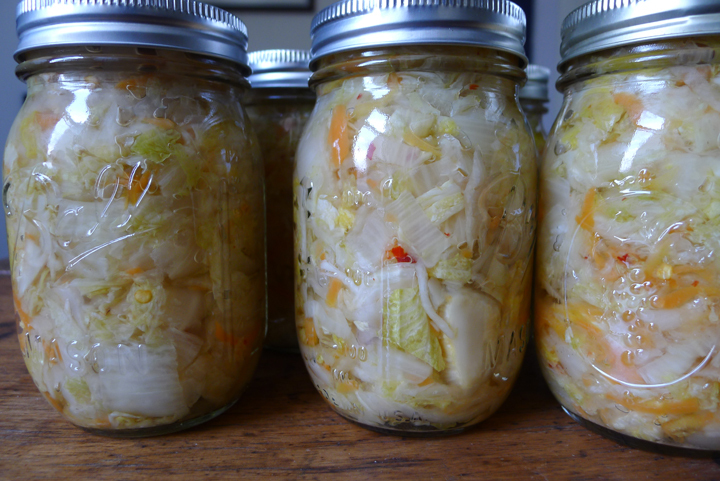 And more good news: Some studies show fermented cabbage has compounds that may prevent the growth of cancer. too bad you don’t have the recipe for this. It would be interesting to try.